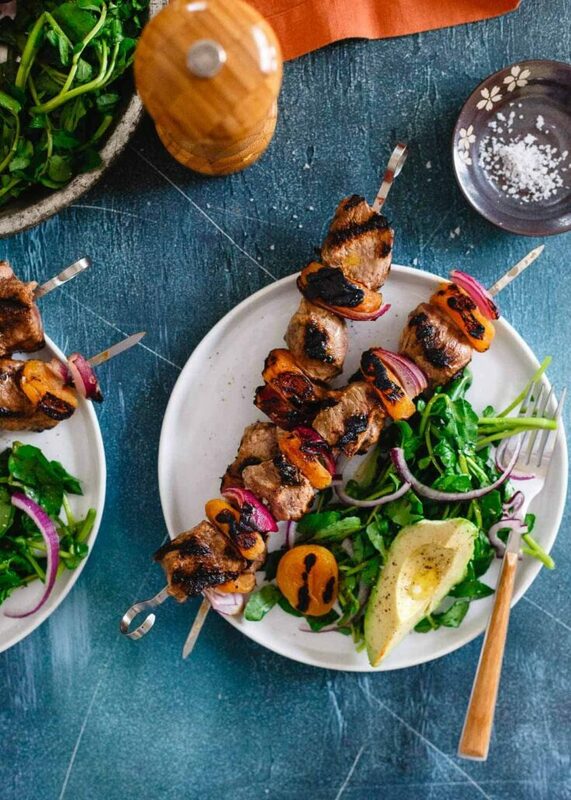 These smoky grilled apricot lamb kebabs are a great way to enjoy American spring lamb. Special enough to serve for Easter, easy enough to grill up on a weeknight! My 35th birthday is on Friday. 3-5. Officially middle age. Thirty hit me hard five years ago and this milestone feels no easier. Everyone’s all “30s are the new 20s” but honestly, all it feels like to me is how fast life is flying by. Which is exactly why we decided to skip out on Easter this year and head back to Mexico on Sunday for the second time in 3 months. *This post is sponsored by the American Lamb Board. Cabo San Lucas, my happy place. A place much worthier of spending my official entry into middle age than New York and its pathetic attempts at spring right now. 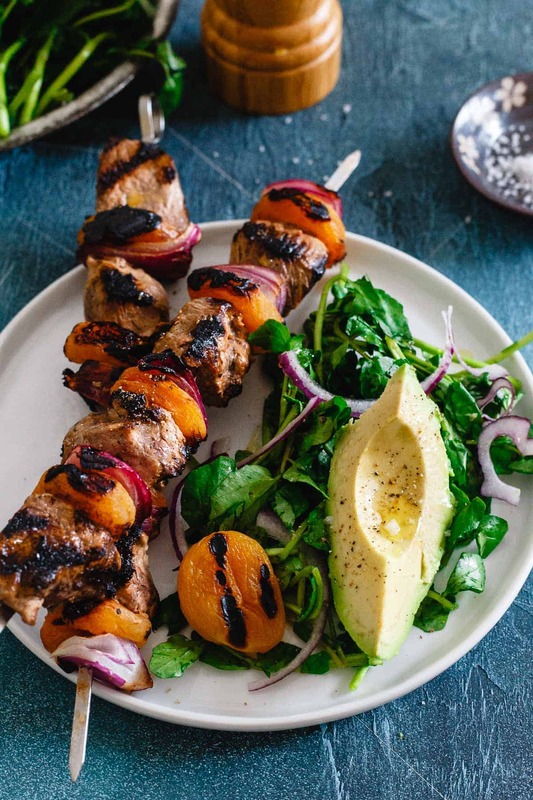 So, while we’ll be basking in the Mexican sun eating tacos, fresh guac, sippin’ on margs and lounging by the pool, I’m still thinking of you guys celebrating the holiday with these smoky grilled apricot lamb kebabs. You know what I’m sick of after a long winter? Roasts. Like seriously, who wants another holiday meal cooked in the oven right now? It’s mid-April, let’s turn on the grill and kebab it up for Easter. Less clean up, fresh air and the return of meat on a stick. You down? I know the classic combination is lamb and mint but last year I made these spring gyros with apricot salsa and fell in loooove with the combination so much I decided to continue it this year. 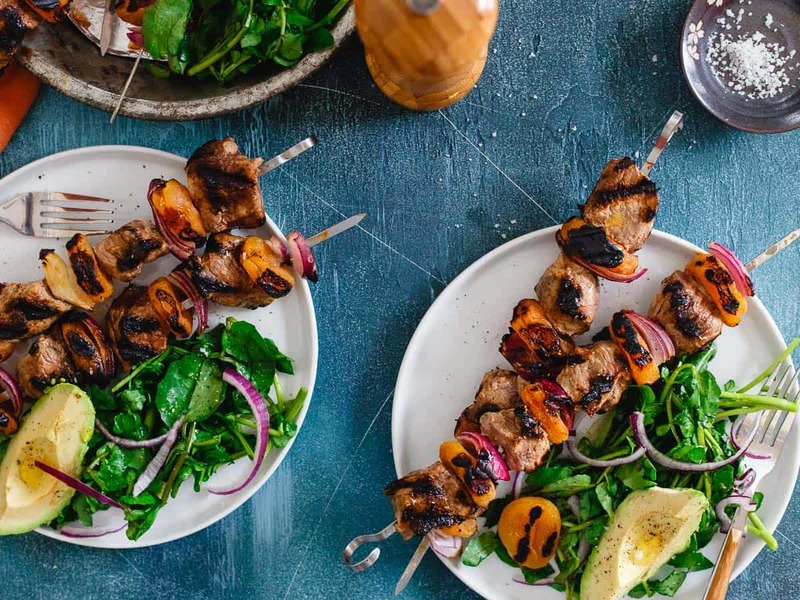 For these kebabs, American lamb is marinated in a smoked paprika yogurt lemon sauce for a few hours to get it nice and tender and then skewered with red onions and dried apricots that have been soaked in hot water making them nice and plump. 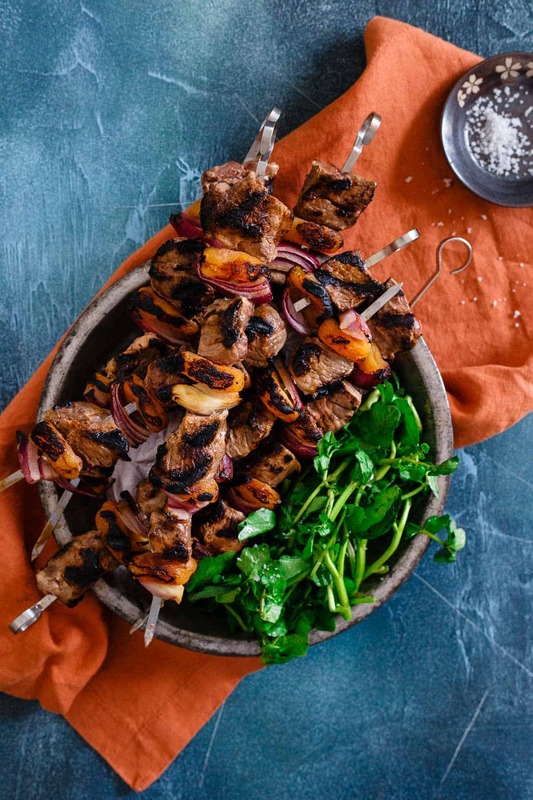 The result is a smoky, grilled meat kebab with a nice balance of sweetness. I love it simply served with a lemon dressed watercress and avocado salad but any fresh spring greens will do. One thing I will be sad to miss this Easter? Cadbury crème eggs (my once a year junk food/candy treat I love with all my heart) and how my mom still buys me some knowing that, even at age 35. Think they sell them in Mexico? Check out the American Lamb Board’s spring entertaining page for lots of tips, recipes and info on your holiday lamb dish. There’s also a fun pin it to win it contest going on until April 28th with some great prizes! Add the yogurt, lemon juice, smoked paprika, oregano and pepper to a large bowl, whisk until well combined. Add the lamb meat and toss until all the pieces are coated in the yogurt mixture. Cover and refrigerate for at least 1 hour. Place the apricots in a medium bowl. Cover with boiling water and let sit for at least 30 minutes to plump up. 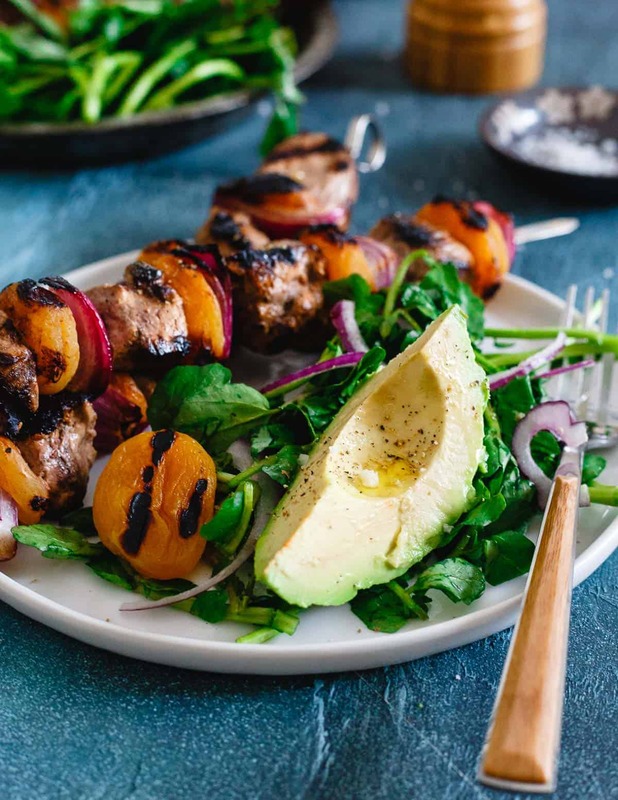 Thread a piece of marinated lamb, an apricot and then a piece of red onion onto a metal or wooden skewer, repeat in that order until the skewer is filled with all the ingredients. Grill kebabs over medium-high heat on an outdoor grill or stove-top grill pan, flipping once browned and grill marks appear, about 2-3 minutes per side. Apricot and lamb is such a BOMB combo! I can’t wait to bust out the grill and make these! Love this for Easter instead of the regular huge roast or ham. Happy Birthday! I turned 38 this year, and time is just going by too fast – it isn’t the number that is the problem, it is that the numbers are coming too quickly! Have fun in Mexico and have a marg or 2 for me! Those apricots must give these so much flavor, they look amazing! I thought I would have a huge issue turning 30, but for some reason I didn’t. I think I might be in denial! Ha. I’d say you made a smart decision to hightail it to Mexico, I’m insanely jealous, it’s my happy place too. These kebabs are so pretty, and I’m sure, equally as delicious. If you’re old, then I’m ancient Gina!! UGH! These kebabs sound so yummy. I love the apricot/lamb combo. I’d get the Cadbury eggs before you go! Happy Birthday! Happy early birthday. . and hey, age is just a number! congrats on getting out to Mexico again! have a great time and I love these lamb kebabs!! I love everything you make!! Once again you’ve hit a home run! I adore this combo of apricot and lamb. So good. These sound perfect! These kebabs look so very tasty!